In the days and weeks after the motorcycle accident, you are going to be overwhelmed. If you suffered a traumatic injury, you need to focus on your health and recovery, which may include surgeries, physical therapy, pain management, and other treatments. For some accident victims, the recovery period can be extremely painful and lengthy. However, during this time our Pinder Plotkin Legal Team is investigating your accident to identify the liable parties and prove fault. Below is a discussion of fault, injuries, and evidence related to a motorcycle accident. IMPORTANT NOTE: Do not talk to the insurance company for the other driver or any other party representing anyone related to your motorcycle crash. Always consult a Maryland motorcycle accident attorney immediately. Insurance adjusters and defense attorneys may try to gain information to use against you to deny or undervalue your claim. DO NOT trust anyone to protect your best interests except your Maryland accident attorney! Distracted Driving, including texting, talking on a cell phone, eating, grooming, adjusting controls, using social media, reading, etc. Traffic Violations, including failing to yield the right of way, following too closely, illegal U-turns, etc. The factors that caused the motorcycle accident help to identify the liable parties. 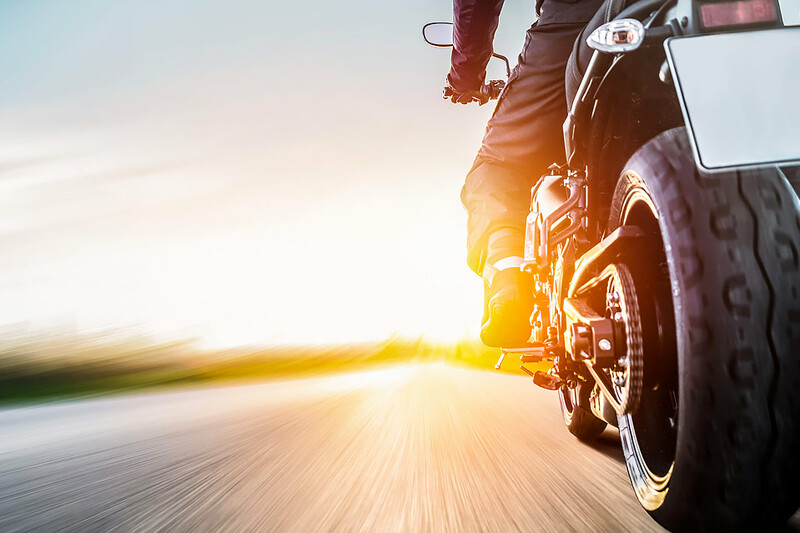 Parties who may be responsible for damages in a motorcycle accident claim include drivers, government entities, truck drivers, companies, manufacturers, city agencies, and others. Identifying the liable parties is not the only important step in an accident investigation. Our team must search for evidence that proves the other party was responsible for the crash. For complex crashes, our team may consult experts to recreate the accident scene or provide scientific evidence based on skid marks and property damage. Because investigating a motorcycle accident can be complicated, you should work with a team of experienced motorcycle accident lawyers like those of Pinder Plotkin LLC who understand what is necessary to prove fault and liability. When a motorcycle crashes with another vehicle or object, the motorcyclist and passenger are vulnerable to a variety of serious and traumatic injuries. In many cases, a rider may be thrown from the motorcycle or crushed between vehicles. A motorcyclist does not have the same level of protection that an occupant of a passenger vehicle has during a collision. Therefore, most motorcycle crashes result in injuries to the rider that require medical care and hospitalization. In some cases, the injury may be so severe that the rider may need surgery and extensive physical and rehabilitative therapy. The medical treatment you receive depends on the type and severity of your injuries. As discussed above, some motorcycle accident victims must endure one or more surgeries, physical therapy, counseling, vocational therapy, and reconstructive surgery. For some victims, motorcycle accident injuries can result in a permanent impairment that requires ongoing medical care and personal care. The recovery for motorcycle accident victims can be long, frustrating, costly, and extremely painful. You do not want to settle your accident claim until you have recovered fully from your injuries. Your doctor needs to state that you have reached maximum medical improvement (MMI) before our Maryland motorcycle accident attorneys will negotiate a potential settlement of your injury claim. The reason we wait until you reach MMI is to learn from your medical providers if you suffered a permanent impairment or will require ongoing care. For permanent impairment and ongoing care, you may be entitled to additional compensation from the liable party. Therefore, while you are recovering from your injuries, our Pinder Plotkin Legal Team is working behind the scenes to gather evidence to prove damages. In addition to proof of liability, you must also prove you suffered damages to recover compensation for your claim. We work to gather and organize copies of medical records, invoices, bills, statements, evidence of lost wages, and other evidence of your financial damages. We are building your case for full compensation of all damages while you are working hard to recover from your injuries. Once you reach MMI, our Maryland motorcycle accident lawyer works closely with your doctor to obtain an impairment rating and prognosis. We may also consult financial experts to project future losses. After receiving all information and evidence, our lawyers calculate the value of your claim to begin negotiations with the insurance company and other parties.